So I started my SWAP topic earlier today and it took me some time to get my post together... and then I went to post and the site was down. ARGH!! Of course I did not save a copy of the post anywhere. So, I'm using elements from my 2018 & 2017 plans since I didn't sew up either plan. I'm even reusing my inspiration photo from last year. My true inspiration is my stash and my need for new clothes but the photo does capture some elements that illustrate the plan, including of course color. I like this image for a few reasons: the muted dark colors, the lines and grids of the buildings which resemble stripes and plaids, the peaceful night sky, and that it depicts a city. I'm a Chicago girl, not a New Yorker but it still works. If you look at the full size image, you can see all kinds of muted colors in it, on top of the obvious black, dark blues, greys, and accents of white. The other colors include blue-violets and periwinkle; muted teals and greens and lighter greyed blue-greens; brick, muted maroon or burgundy, dusty rose, dusty coral or terracotta, rosy brown; and all kinds of taupes, tans, and beiges. So it lends itself to multiple accent colors that I have in the stash. This is my basic outfit style: dress worn as a top with a skirt or 2 underneath and a cardi on top. For my actual SWAP, my first need then is new skirts. My skirts are in dire shape. I can alter two by tightening the elastic waist and will do that a.s.a.p. I figure I need at least four skirts to get going. It would be good to have five, but I'm not sure if that will work within 11 garments. We'll see. I figure I need at least 5 upper body garments for this plan, including a minimum of 3 dresses. To keep things simple, I probably won't attempt to sew any other type of top (t-shirt or tank, etc.). I also need at least 2 cardigans or toppers. Realistically I have several RTW dresses that will do for now even if they're not ideal. I would actually like to do some new Alabama Chanin tanks but maybe I should wait for summer 6-PAC to attempt those! It would be lovely if I could use my two wildcards to make an anniversary dinner outfit, but I'm guessing my hands will be full working on new patterns so hopefully something within the basics will do. I have multiple solids, including wovens and knits, of each. I also have a few more fabrics in these colors that would work as neutral - a black cotton pinstripe and linen/cotton plaid in both a black and a very dark midnight blue colorways. I find I am really excited about some of my navy fabrics this year. I'll write more specifics about fabric & garment pairings and patterns in a separate post soon. But first, my updated life story in the next post lol. So, this is just a quick update of my life since I last posted regularly. But first, I should thank the nice SG member who gave me a gift subscription for 2018. I feel bad that I have let you down by not posting or participating as much in 2018 as I have in the past! However I am very very thankful that you thought of me! Thank you so much, I appreciate it more than I can say. So, my life story. Last year was rough! I posted at the time about my husband's heart attack. He's doing great now. There was a lot of adjusting going on during the first part of 2018 though (diet, cooking, activity, etc.). Then in May, I literally had gathered my fabrics and cleaned & organized my area, etc. in preparation of beginning to sew the next day... and then that night I found a bedbug on our futon. I was up till 2 a.m. that night! It was a nightmare with so much cleaning, throwing stuff out, emptying out closets & drawers, etc. for the exterminators, etc. I ended up throwing away more than I should have sadly. It took 2.5 exhausting months to finally be cleared. And then we had to leave for Alaska for my niece's wedding the very next week! The only thing I sewed were my sad failed leggings and one successful skirt alteration (yay). I had to buy a dress in Anchorage to wear to the wedding. (I also altered dresses for two other nieces!) Then in the fall, our building had scheduled multiple upgrades which was awesome, but it means there were workmen in the apartment every few weeks. For example: new windows. Awesome. But the entire place was covered in dust & dirt afterwards. I never really got it together. Life was crazy. But anyway. Here is a photo of my sister and me with our niece at her wedding! We had a really nice time. And here's to 2019! So far it's been great. I participated in a weight loss contest with my sister & brother and one niece and we won! So I'd say it's a good start and I'm optimistic about finally finishing a SWAP. I've photographed my potential fabrics in color groupings but unfortunately the lighting was weird and the colors aren't quite right. But here they are anyway. I love all these fabrics too much if that makes sense. I have a hard time choosing what to make from each because when I look at them, I want like 5 garments in each fabric. But I have to start somewhere, and I have decided what to do first. Yay! (NEUTRAL #2) Long skirt, ankle-length, black linen (fabric #11 or 12) lined with lightweight cotton voile or batiste. I would like to do something like the skirt on the left in this pic, except I would add a yoke. (NEUTRAL #1) Long skirt, ankle-length, dark navy linen (fabric #20), also lined in cotton. 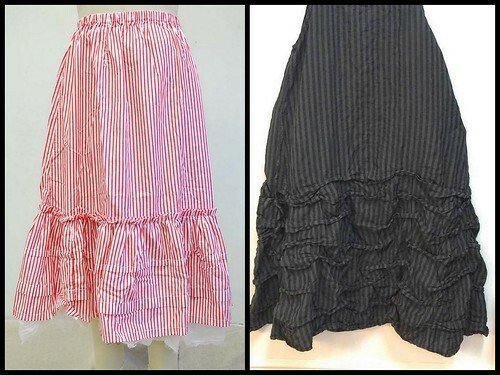 I would love to do one of these two styles, but I could just repeat the same style as the black skirt. (ACCENT #1) Blue/black plaid (fabric #15) mid-length skirt (to layer with long skirts above or wear alone). I will do something similar to style of the grey striped skirt shown in #1 above, but again with added yoke. That should get me rolling. My skirts are easy to sew and self-drafted. I will need to revise my yoke draft which I just re-did last summer, but it should be relatively quick. The only thing that takes more time is doing the embellishment, but I think it will be worth it. As I said, I really need skirts, and once I have a few made that I can wear now, I will decide what to sew next. I have about a week and a half off and though I would love to begin my SWAP sewing... reality dictates that I do some repairs & alterations first for myself and my sister. But my mind keeps turning to SWAP, so I'm just adding some thoughts here before I forget them. Already I've started fussing in my head over my SWAP assortment. Always I have this worry that I need to make the plan more interesting or God forbid "perfect". I know, it's ridiculous. Anyway, before that started, I sat down with my fabrics and was my usual practical self. I came up with a pretty good plan that fits into the rules, addresses the season change during SWAP, and uses only fabrics I love. It does involve purchasing one fabric (cobalt blue linen) but I can live with that. I also have some reasonable options to switch out a few garments and even to MAYBE add grey back into the plan if I really want it. Side note - I realize why I had a hard time this year and last year trying to add grey to my navy & black plans. I don't feel like it's cohesive with only one grey piece; in fact, I feel there needs to be at least two PLUS a fabric that combines grey with navy/blue and black -- which I don't have and have not been able to find. I've made my peace with no grey in the plan. In fact it's all blue & black with a little bit of white as part of the plaid & stripe fabrics. Boring, perhaps? Maybe, but I like it. Dealing with the season change during SWAP is something all of us 4-season gals deal with... I need things to wear now. So at the beginning of SWAP, I will sew 5 garments that I may not wish to wear in early May. 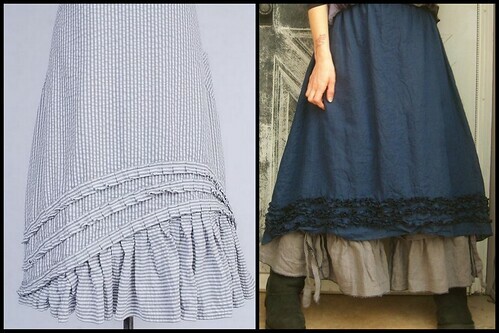 First are the two lined linen skirts mentioned in my previous post (fabrics in 2nd column). Although they'll probably be okay if it's a "normal" May, past experience tells me they won't work if it's hot & humid. So I will also sew (either at the end of SWAP or just after) 2 cotton eyelet skirts, one in black & one in navy (pictured at top & bottom over 1st/2nd columns). Second, I have two thermal shirts that my husband discarded as they were too big, one black & one navy (1st column). I think they are large enough that I can cut them apart and use as fabric to sew into me-sized cardigans. Again, toward the end of SWAP, I can sew lightweight replacements in cotton jersey (not pictured), including my much-wanted black & navy Alabama Chanin inspired open cropped cardi. Third, I'll sew up a heavier black linen pinstripe as my fourth skirt (middle of 3rd column). Its warmer-weather replacement will be the textured cotton/linen black plaid (bottom of 3rd column). That's 5 garments plus replacements. Best case scenario: I get all 10 sewn by April 30, wear the warmer versions through the cold weather and use the lighter versions in my official SWAP. Worst case scenario: I wear the cold weather versions for my photographs and get busy in early May with the replacements. I'm sure that was hopelessly boring but I'll need this post to help me stay on track! After deciding my previous post was rather chaotic, I am posting a summary of my Plan A in a separate post here. Note that numbers differ from previous pics. Garments marked with * may be replaced with warm weather versions (#3b, 4b, 5b) as described in previous post. OK, I feel more organized now. Now I need to sew my boring stuff and get on with SWAP! I am really excited about these fabrics. Yay! I still haven't started SWAP sewing but I've made a great dent in the repair & alteration pile. I was really tickled on Monday to mail a box to my sister with two altered skirts and 3 hemmed PJs plus a few tanks. Like me she's lost a lot of weight so I'm doing fast alterations on her work skirts and also passing along some hand-me-downs from my closet that now fit her! I still have left to do: 3 alterations for me (top, dress, cardigan) and 2 repairs (skirt for me, shirt for hubby) so that's not bad at all. Meanwhile, a kind sewing friend offered to send me some fabric that includes grey with black and navy! It looks like it should play well with my other fabrics but I'll have to wait until I have it in my hands before figuring out what it wants to be. ...And then I read Dawn's (crazyquilter's) latest SWAP post. I was really taken by the interesting trim on this Ivey Abitz frock! I remember discussing with others in the Lagenlook thread how this might have been done and at the time I think I resolved to experiment with it, but never did. Anyway, I love how it works with the striped fabric! And I so happen to have a black & white pinstripe in my collection, although the stripes are closer together than the Ivey Abitz fabric. Of course, this is exactly the kind of thing a person starting quite late with SWAP sewing should NOT attempt. So I may put off the fun experimenting with this embellishment, OR if I have time, I could just add a single row of this trim to the hem of one of my dresses. That might work! But honestly I like the idea of a skirt with multiple rows. We'll see. Sorted through my fabrics (including new acquisitions) AND my priorities LOL... and for now I am saying goodbye to all non-SWAP sewing, alterations, etc. Except for the urgently needed leggings. It's the only way I'll be able to come close to hopefully finishing this SWAP. And I really want to finish for once. All that winter stuff I thought I would sew? I've survived this cold winter so far without it, including the polar vortex, so I think it can wait. Trying to push myself to sew that other stuff while not wanting to has been contributing to my sewing block. I found in my stash a navy/black marl long-sleeved t-shirt (see pic above) that I will convert to a cardi for SWAP. I'm not sure if the shirt is big enough to cut new pattern pieces from, but if not I will just refashion it and count it as my RTW piece. The colors in the T are just perfect with my other fabrics. Plus I had some issues with my other knit fabrics so will have to reshuffle my cardi ideas a bit. Bonus: I think these fabrics work really well with my inspiration image!! Other bonus: This plan will work with my 6PAC plans and also my version of the Vivienne Files' year-long wardrobe plan. Plan is firm for 10/11 garments; final/fifth dress could be the blue/black plaid, solid black linen, or solid cobalt linen (fabrics marked with * in pic). I'll see how I feel about it when I'm further along in the plan. So, first up will be the cardi conversion. I really want and could get a lot of use from a navy cardi right now. Hope to have a productive weekend! It's been a month since I've posted and I've got no sewing done at all! At this point it feels like a deja vu of past failed SWAPs... And it is, but it isn't. I don't want to go on about it, but as mentioned above I've lost a good deal of weight. I posted elsewhere on the board but I've been going through a style/fashion crisis and have been trying to figure out what I actually want to wear at this size and what actually might look good! Basically I have second-guessed everything. In the end, I decided I do in fact wish to stick with the planned styles after all. However, I'm not feeling the ruffles at the moment so I will probably do simpler styles of skirts (bonus: faster sewing) and do less embellishing in general. I can always add more later if I feel a garment is lacking. So, realizing that I am running out of time, I will just forge ahead anyway and see how far I get. As we have begun to have a few warmer days here and there (and by warmer I mean 40 F!) I noticed that I really want those cropped cardis to wear with my dresses. I have one RTW cardi recently acquired that I absolutely love (and may use as my SWAP RTW option!) but it is too lightweight and delicate to wear regularly right now. It is navy and my desire to wear it really highlights my need for both overlayers in navy and cropped toppers in general. I have partially cut out 2 skirts (navy & black eyelet) but stopped as I was no longer certain of what style I wanted. However, I will go back to what I decided a month ago and get that navy cardi done first. I may then just do the black one and get it over with, or try to finish my easy skirts next. So as far as sewing with a plan goes... or sewing at all goes... this year can only be accounted a complete failure. But actually I feel quite content. I had last week off and had planned to finish the garments I have started and to cut a few new things, with the intention of pushing to get a simple version of my SWAP plan finished on time. However, I took some time to think and have a chat with myself the first weekend. And I came to the realization that the main reason I have such a hard time getting going with SWAP is that I have an anxiety disorder and pretty bad performance anxiety. I hate to even write that here since nearly everyone has some performance anxiety! But mine is pretty bad. It doesn't seem to matter that SWAP functions more as a friendly sew-along than a cut-throat competition, or that the people here are so very nice, or that there are no judges, etc. In addition, I never feel like starting projects in January, I'm always exhausted post holidays. And this year there was the added confusion about size as I am still losing weight. Once I had come to understand myself a little better, I felt quite pleased and content deciding not to push to finish. I still feel a little sadness not to participate but nothing too horrible. I feel I learn something every year with my SWAP plans and I do enjoy the planning! This year I do have some partially completed garments that I can continue to work on over the next few weeks. I suppose in addition to gaining more clarity about my inner workings I have also learned that I prefer not to take on a massive wardrobe sewing plan when my ultimate size is so unclear. I can live with buying some RTW, as I have, until my weight has stabilized. I've also realized that, even though I prefer the rules this year and last year versus past years in that we aren't forced to make specific garment types, the strictness surrounding colors and more so the restrictions on prints and fabrics used as accents don't appeal. Then again, my ultimate SWAP rules go something like this: you are all designers - make 11 garments that form a collection using cohesive color combinations and be sure to have enough garments to cover the top half and bottom half of your body. I guess I don't like rules and maybe am a bit of a rebel after all. I mean, I absolutely enjoy the puzzle of trying to match my likes and needs into the rules, but doing that AND sewing a collection I actually want to wear are two different things. But who knows, if this forum is still around next year and SWAP is still offered, I will try to participate again. Meanwhile, I may sew up the garments as planned or I may just randomly sew whatever I feel like. If I do sew a belated SWAP, I will share it on this site when it's done. Happy sewing, fellow SWAPers! Can't wait to see the finished collections!